Ask a child to draw a picture of a house, and you'll probably get an image showing a basic gable roof. 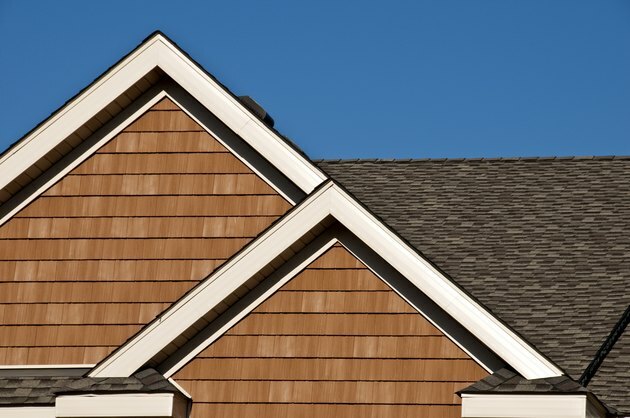 It's a common type of roof that has two sides that extend from a central ridge to form an "A" shape. The actual gables are the triangular insets on each end of house. The ancient Greeks and Romans often used the gable, which they called the tympanum, as a background for frescos and relief designs, and some Victorian architects embellished it with decorative trim. Gable roofs shed water well, but they aren't the best option in windy locations. The most familiar type of gable roof has roof decks of equal sizes that extend to the side walls. They may end at the walls or extend past past them. When the latter is the case, builders usually cover the underside of the part of the roof that extends with soffit boards. When the wall on one side of the roof is higher than the wall on the other side, the roof style is called a saltbox_._ L- or T-shaped houses, which feature a section extending perpendicular to the main part of the house, may feature cross-gabled roofs. Each section has a gable roof, with the two ridges running perpendicular to one another. A gambrel, or barn-style, roof is a particular type of gable roof in which the slope is broken into two sections with different pitches. The gable roof is one of the best choices in areas of heavy snow or rainfall because it has a steep pitch for efficient runoff. Since it's such a common roof design, builders don't have to construct the framing for them onsite. They can use assembled trusses that consist of a pair of rafters joined in a triangular shape with a tie beam. Trusses rest on the walls of the structure, and builders secure them with metal strapping or ties before covering them with plywood and roofing material. It's a common practice to inset a window or vent grid in one or both of the gables to ventilate the attic space under the rafters. You can also add a row of clerestory windows along the straight side of the house to let in more light. A gable roof is one of the simplest roofs to construct, but it isn't the best choice in high-wind areas. The wind can work its way under the roofing materials and peel them off, or it can blow under the soffit and lift the roof right off the structure. Roof stability can be assured by properly bracing the roof to the structure, but a hip roof, which features four sloping sides instead of a pair of flat roof sections, usually holds up better in areas prone to hurricanes and windstorms. In most areas, a gable roof is a simple, versatile roof option that works with different styles of homes. Its simple design makes it easy and cost-effective to build.